A little while ago, The Girl caught wind that I do not like clowns. I suspect traitor Mom. Anyway, one of her favorite games to play with me is to come barreling down the hallway screaming,” Dad, Dad! There is a clown in the backyard!” And then she falls down in hysterics, thinking this is the funniest thing she has ever heard. A slight variation of this game involves her running up to me and saying, ” Dad, Dad! There is a clown in the backyard…and he is carrying a pickle!” Yes, you guessed it. I don’t like pickles, either. 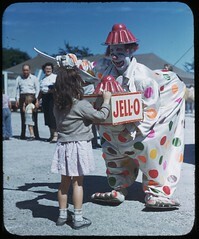 Anyway, I don’t know where this clown phobia comes from, but methinks I might have run into this guy when I was a kid. That is some serious Jell-o that clown is packing in the backyard.